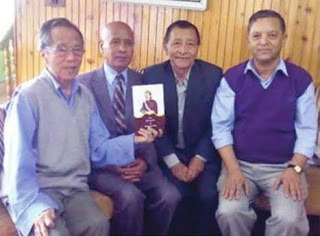 Two weeks before the 201st Birth Anniversary of Adi Kavi Bhanubhakta Acharya, one of Darjeeling's literary greats Dr. Gokul Sinha gave him an advanced birthday present - an English translation of his Ramayan. The book was launched yesterday by Gorkhali Icon Dr. Indra Bahadur Rai amidst a small ceremony at his place in the presence of Shri. Chandra Sharma and Shri. Manikamal Chettri. Speaking at the occasion, Dr. IB Rai said, "though Bhanuhakta's Ramayan has been translated into other Languages, but he had to wait for 200 years to get it translated to English.... I congratulate Dr. Sinha for taking up this great endeavour." Dr. Gokul Sinha gave him an advanced birthday present - an English translation of his Ramayan. The book was launched yesterday by Gorkhali Icon Dr. Indra Bahadur Rai amidst a small ceremony at his place in the presence of Shri. Chandra Sharma and Shri. Manikamal Chettri.